This Friday and Saturday parents and daughters will team up to work on engineering projects at Weber State University’s annual Parent-Daughter Engineering Day, hosted by the Office of Career and Technical Education. Two different events will be held at both WSU campuses on Friday Nov. 13 and Sat Nov. 14 respectively. The event at Davis Campus will be held in building three from 5 p.m. to 8 p.m. and the event on the WSU main campus will be held from 9 a.m. to 1 p.m. The cost for a team at the Davis campus event, which includes one parent and one daughter, is $25. This fee will cover all materials, dinner, two tee-shirts and a goodie bag. Those families with more than one child wanting to participate can pay an additional $12.50 per child. The price for the Saturday event at the WSU main campus is slightly higher, with the initial registration fee at $30 and $15 for each additional child. “This is a fun, problem solving and engineering oriented event for girls in sixth through ninth grade,” Dana Dellinger, Director of the Center for Technology Outreach, said. According to Dellinger this event seeks to dispel the notions that science and engineering have to be serious. Dellinger went on to explain that the atmosphere will aim to be casual and will provide parents and their children a chance to bond. “You will be sitting down, working on problem solving activities with your child,” Dellinger said. The activities at the event this year will include Protect Your Noggin, which has a biomedical engineering focus, and Hydraulic Puppy, which has a mechanical engineering focus. “Parents with their middle school daughter come and do engineering projects for the event,” Celeste Baine, engineer, educator and author, said. According to Baine last year’s event saw a tremendous response and they are hoping for even more success this year. Baine says she enjoys working with the parents and daughters that come to this event in Utah. 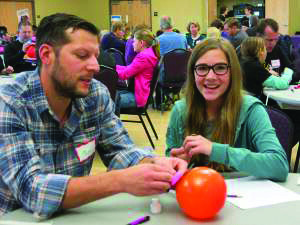 While this event is only for girls in sixth through ninth grade, there is a Family Engineering Day planned for children in third through seventh grade coming up in the spring. For more information about this event visit the website or contact Dana Dellinger by phone at 801-626-7552 or via email at danadellinger@weber.edu.